This is a 1/24th scale Kyosho Mini-Z, F1 . (R/C Minimized Racing Car) No Gluing or Painting, Race-Ready, Right Away! FEATURES: Ready-to-Run with Pre-Installed Electronics and Radio Equipment. Small size makes it easy to race in a small area. Coil-over spring shock on front upper a-arms for realistic suspension action. Semi-pneumatic ridged tires on stylish wheels. A 4-pinion set that allows you to gear up/down for different track conditions. Rear T-bar that compensates for any imperfections in the driving surface to provide maximum traction. The T-bar also controls the adjustable wheelbase. Stock electric motor delivers strong power output for exciting racing, with adjustable mounting positions to increase traction or add stability. Rugged pre-painted polystyrene body. Specially designed mini servo to provide fully proportional steering, even at low speeds. Receiver, servos and linkages are all pre-installed in the car for convenience. 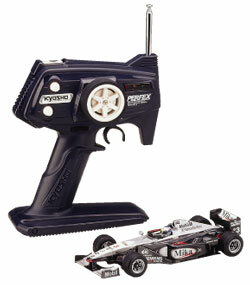 Kyosho Perfex digital proportional 2-channel radio has the following: Adjustable steering dual rate. Steering and throttle trims. Servo reversing switch. LED battery power indicator. Retractable antenna. Charging jack for optional NiCD rechargeable battery (not included, see COMMENTS). Micro receiver with efficient, FET high-frequency amplifier. One Micro Servo and high frequency electronic speed control, that provides, forward, reverse AND braking. INCLUDES: One Ready-To-Run Mini-Z F1 Race Car with Perfex KT-2 Radio System Three Orange Road Cone Pylons Three Orange Road Marker Discs Three Extra Pinions (7T, 8T, and 9T) Three Motor Spacers for different pinions used One Motor Case Mount B for optional high motor mounting One Wheel/Pinion Wrench One Instruction Manual REQUIRES: Attaching the body to the chassis Installing transmitter antenna into transmitter Installing alkaline batteries into transmitter and car (4) AAA size alkaline batteries for the car (8) AA size alkaline batteries for the transmitter SPECS: Chassis- Length: 7.2" (177.7mm) Width: 3.2" (81mm) Height: 2.2" (56.5mm) Weight: 6.7oz Minimum Turning Radius: 7.9" (200mm) Body- Length: 7.2" (177mm) Width: 3.2" (81mm) Wheelbase: 5.1" (129.3mm) COMMENTS: Charging Jack is functional. Use a Futaba-style transmitter charging system with this jack, HCAP6010 or DTXP4010. Length of chassis is adjustable to accommodate different body sizes. The adjustable wheel base lengths are: Short 86mm Medium 90mm Length 94mm Motor height is adjustable for different bodies. For the optional bearing set, use DTXC1386.